Even in this digital age, a business card is an important networking tool. It makes sense that business cards should be professional, attractive and memorable and that the card design should not only reinforce the corporate branding but, obviously, include the key contact information. If not, what’s the point? 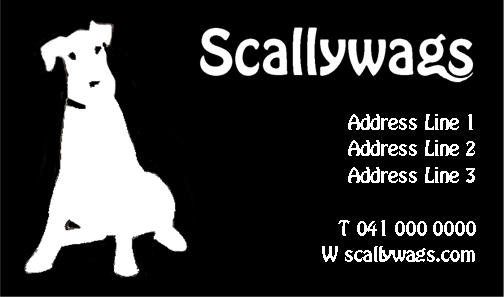 This is the business card concept of Scallywags – a concept dog grooming and boarding kennel/pet sitting service. 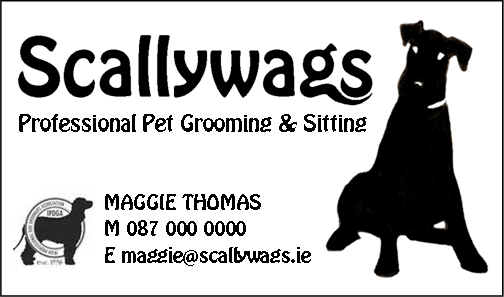 A simple dog silhouette image was developed – this should attract the relevant target customer! The logo font (developed around the font type ‘Hobo’) is clear without being too plain or too fussy – it’s a non-corporate choice but works well for this business type. The card design is monochrome: the front of the card displays the key contact information while the back (reverse colour scheme) displays the general contact information.